WOW -"It Is Too Late Now"
Anyone who says they have no regrets is either perfect or is lying. All of us are in a constant tussle with time, either wanting it to go faster, or wanting to turn it back to change something that we did or didn't do. The latest WOW prompt was "It Is Too Late Now", which wanted to bring out all the thoughts, stories and hope that racing against time brings. And what a ride it has been. We got to read some excellent posts, which we wish to share with you now. Read these brilliant posts that will brighten your Monday! Congratulations to all those who are featured here. 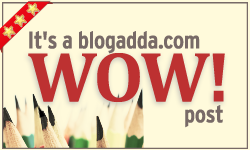 Thanks for being a part of the WOW family, and continue to blog with us!